Swiss luxury watch brand Perrelet dresses its 41 mm-diameter Turbine XS Taste models in a palette of trendy colours like shades of blueberry, blackberry and lemon yellow etc. This fresh and glamorous ladies’ line is set to conquer the hearts of modern women. Fabulously adorned, the turbines of the double-rotor automatic movement whirl steadily over white dials set with rows of diamonds. The turbine graceful dance creates the illusion of dewdrops glistening on the surface of fruit in randomly sprinkled, infinitely varied patterns. The steel cases, fitted with white satin straps, echo the summery colours in their bezels rimmed with sapphires, topazes, amethysts and citrines. While the latter are systematically baguettecut, the sapphires, the topazes and the amethysts stones may be either brilliant-cut. Two cherry red models are the exception to the rule: a more reserved one featuring a bezel set with brilliant-cut rubies and a white turbine matching the strap; and a sparkling one distinguished by a bezel set with baguette-cut rubies, a white turbine and a red strap. 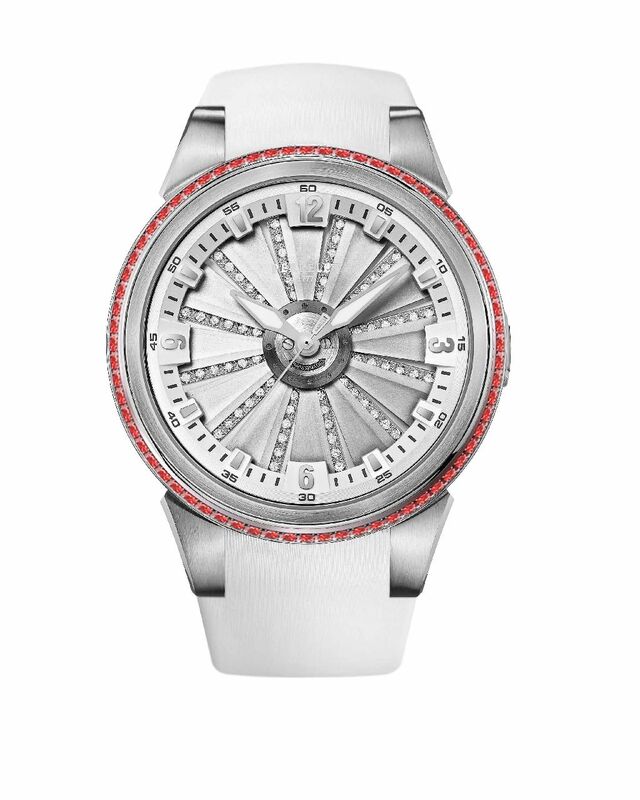 Dial: Dial set with 72 diamonds beneath the Turbine. Case: Stainless steel, diameter 41 mm, thickness 12.85 mm, glare proofed sapphire crystal (front and back). Strap: White satin, steel folding clasp. A2062/5 Yellow turbine, bezel set with 60 baguette-cut citrines. A2062/2 Blue turbine, bezel set with 60 baguette-cut sapphires. A2062/4 Turquoise turbine, bezel set with 60 baguette-cut topazes. A2062/3 Purple turbine, bezel set with 60 baguette-cut amethysts.